Flags and Pennants are short-term continuation patterns that mark a minor consolidation before the previous trend resumes. These patterns are usually preceded by a sharp advance or decline with heavy volume, and mark a mid- point of the move. Flag: A flag is a small rectangle pattern that slopes against the previous trend. If the previous move was up, then the flag would slope down. If the move was down, then the flag would slope up. Because flags are usually too short in duration to actually have reaction highs and lows, the price action just needs to be contained within two parallel trend lines. Targets: The length of the flagpole can be applied to the resistance break or support break of the flag/pennant to estimate the advance or decline. Even though flags and pennants are common formations, identification guidelines should not be taken lightly. It is important that flags and pennants are preceded by a sharp advance or decline. Without a sharp move, the reliability of the formation becomes questionable and trading could carry added risk. Look for volume confirmation on the initial move, consolidation and resumption to augment the robustness of pattern identification. In the above daily chart of NIFTY, the flag pattern was formed in the year 2013-14 where it took around 6 months to form and the target of which was also achieved after the breakout. Volumes were also rising and heavy during the formation of flagpole and tend to decline during consolidation. 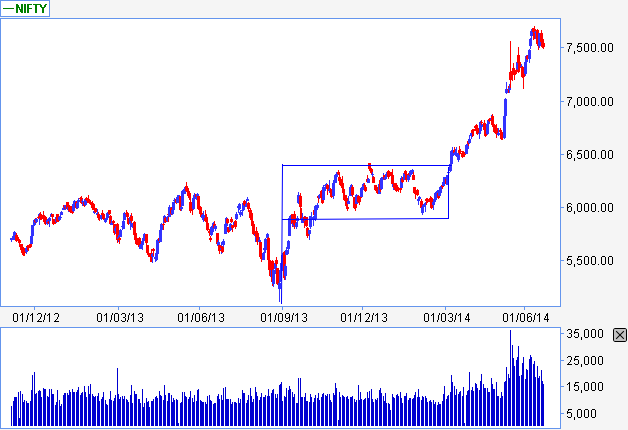 The expansion of volumes were seen as soon as the breakout happened. The rounding bottom is a long-term reversal pattern that is best suited for weekly charts. It is also referred to as a saucer bottom, and represents a long consolidation period that turns from a bearish bias to a bullish bias. Prior Trend: In order to be a reversal pattern, there must be a prior trend to reverse. Ideally, the low of a rounding bottom will mark a new low or reaction low. In practice, there are occasions when the low is recorded many months earlier and the security trades flat before forming the pattern. When the rounding bottom does finally form, its low may not be the lowest low of the last few months. Decline: The first portion of the rounding bottom is the decline that leads to the low of the pattern. This decline can take on different forms: some are quite jagged with a number of reaction highs and lows, while others trade lower in a more linear fashion. Low: The low of the rounding bottom can resemble a “V’ bottom, but should not be too sharp and should take a few weeks to form. Because prices are in a long-term decline, the possibility of a selling climax exists that could create a lower spike. Advance: The advance off of the lows forms the right half of the pattern and should take about the same amount of time as the prior decline. If the advance is too sharp, then the validity of a rounding bottom may be in question. Breakout: Bullish confirmation comes when the pattern breaks above the reaction high that marked the beginning of the decline at the start of the pattern. As with most resistance breakouts, this level can become support. However, rounding bottoms represent long-term reversal and this new support level may not be that significant. Volume: In an ideal pattern, volume levels will track the shape of the rounding bottom: high at the beginning of the decline, low at the end of the decline and rising during the advance. Volume levels are not too important on the decline, but there should be an increase in volume on the advance and preferably on the breakout. 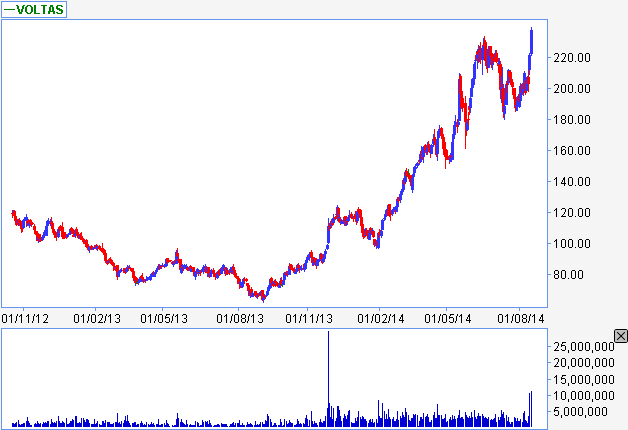 In the above daily chart of VOLTAS, the rounding bottom was formed and stock rose and was multiplied from there. Volumes were also confirming where during the pattern formation volumes were high at the beginning of the decline and were at their lows when bottom was formed and when stock started rising volumes also started expanding.